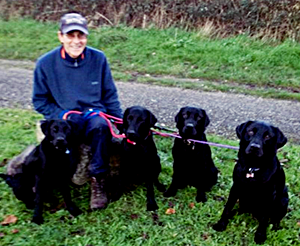 My name is Rob and I provide a dog boarding and walking service to suit your needs and those of your dogs. I look after your dogs in my own home in Dewlish, near Dorchester in Dorset. My home is very dog friendly with a large dog-secure garden. I live with my 2 black labs, Chase and Alfie and am a true dog lover. I promise to give your dogs the same level of care and affection that I give to my own 2 boys.